I have already often seen young men waiting together with their elephants and camels next to busy streets, near to tourist spots and on steep hillsides. Waiting for the next customer, the next fiscal. Their scam is as simple as refined. And without realizing you tread easily into it. Firstly they try to arouse your curiosity. They ask if you have ever had a seat on such an exotic animal or if you have ever been so close to one. They counter scepticism with arguments like “The animals like that!”, “Nothing is bad with this!” or “Try it first!” And lo and behold: You sit on an elephant. Of course the ride is not for free. After coming down, you’ll be asked for a small donation of several hundred rupees. Anyone who thinks that this money is for the animals’ care is wrong. Because the elephant and camel boys pocket almost everything. The animals are in fact only their “working tools”. 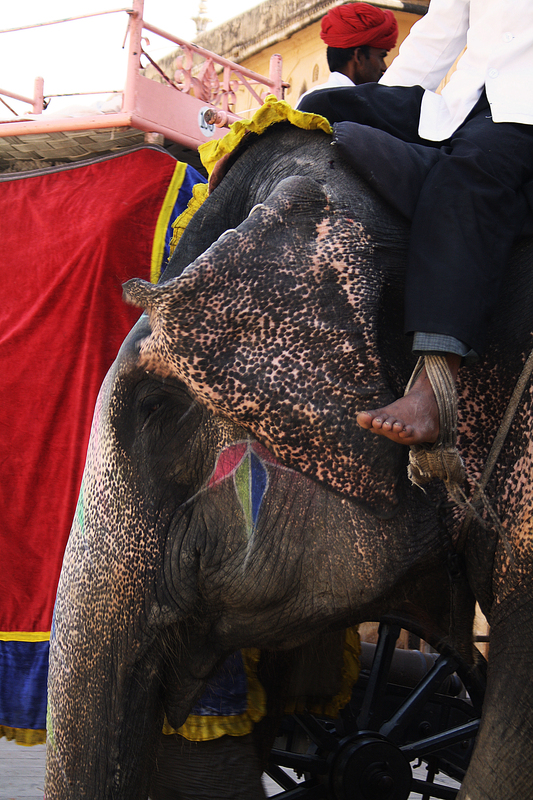 In the recent months I have read many reports from India which talk of the torture of such “animal tourist spots”. Those animals which are trained to transport lazy tourists steep trails or to amuse them – as a show animal or in a circus. The dressage is a real torture for them. Because several days of food deprivation, brutal whippings and the putting-in-chains are just some of the methods they have to go through. In India – so it seems – the symbiosis between man and nature suffers for quite some time. The best example for this is the worship of the cow. Regarded as the reincarnation of Lord Vishnu, the cow is an important part of the Hinduism and is seen on the streets of all big Indian cities. Each temple has its own cow herd, which is painted with natural colours and decorated with cotton blankets and trinkets for festival. And also the law punishes the deliberate and accidental killing of a cow. High fines may result. But the sacredness of the cow has its limits – namely when it comes to food. Every day, I witness how these animals cram their four stomachs with garbage and filth. Because you search in vain for pastures and green meadow in the large molochs of India. Rather the garbage towers and provides a heaven for the hungry cows. But this is a fatal fallacy – and sooner or later the garbage nutrition is a death trap. I myself have heard of Indian vets, who removed several kilograms of garbage from cow stomachs and rescued them with this emergency operation. Much worse than the cows in the big cities life the Indian king tigers. Because older, weaker or endangered ones have a human being on the menu now and then. This isn’t welcomed by the over species human being. But the mankind needs to put the blame on itself. Due to the expansion of residential areas into the Himalayan regions and the increasing deforestation the tiger has been forced back. In the past, its habitat spanned over the entire subcontinent. Today is not even a tenth of it left. 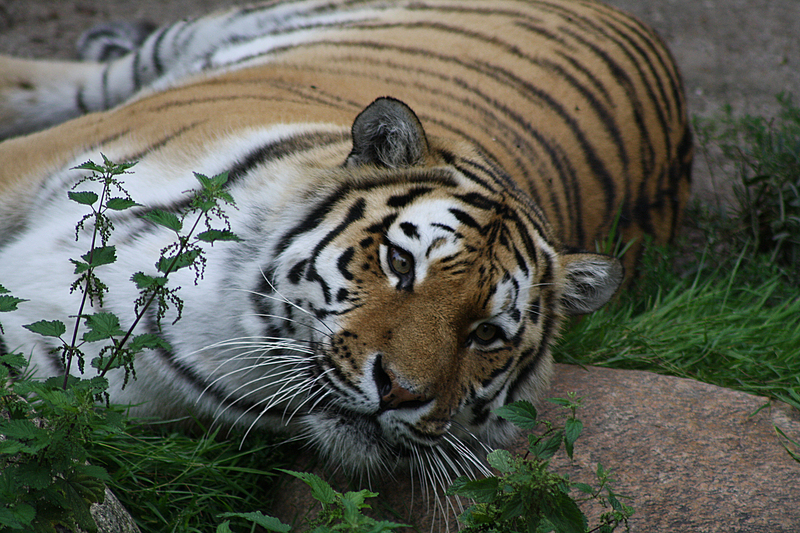 So it happens that the Tiger searches for food in the settlements – and kill agricultural animals. A big trouble for the farmers. But targeted attacks on human beings are rare. Rather forest workers, farmers or other Indians are only killed if they threaten the tiger’s territory. The “man-eater tiger” therefore belongs to the modern myths – and is still deeply rooted in the minds of many Indians. But good news there are some good news in the ailing human-animal symbiosis in India: The human has awaken slowly. The population of tigers has increased by one-third in the last four years – if you believe into the Indian media. And also the many poisonous snakes are still tolerated as flatmates in the dung huts. Previous Post Infected With The Travel Bug? You highlight the suffering of animals that I love with your thoughtful article, and photographs.